Yesterday Mike took Annie out for some daddy/daughter time, leaving me at home to do laundry, watch grown-up TV, and eat Popsicles. Right when I sat down on the couch my phone beeped; Jackie’s dad had updated her Caring Bridge site. After Jackie’s diagnosis in 2008 her family started a journal there to keep everyone updated on her. Her oldest sister updated it at first. After Jackie recovered from her first brain surgery, she took over the updates. At the end, her dad updated it. Since she passed away, her parents have updated it a few times, mostly with letters they’ve written for Jackie. Yesterday her dad made good on a promise to start posting the speeches that were given at Jackie’s service; he began with his own. I’d been anxiously awaiting his because part of his speech included the reading of a letter they’d found written by Jackie. I obviously heard it the day of the service, but I was a bit distracted and nervous for my own speech. I was in survival mode, and I couldn’t really let myself feel anything because I just wanted to get up there and do well and make Jackie proud. I really wanted to read Jackie’s words and let them wash over me. With Mike and Annie being gone, I was able to read them over and over. I could imagine the words written in her handwriting – her sloppiest scribble was always neater than my best efforts. Her letter was divided into two parts: “What I Am Feeling,” and “What Will Help Me.” The latter is what struck me, because it’s something that she and I had spoken about at length. She had correctly predicted the majority of the things people would say to me after Maddie died because similar things had been said to her – well-intended words that didn’t exactly comfort. People ask me all the time what they should say to the parents of a deceased child (I’ve written about it here), but people also asked Jackie for advice on how to talk to someone with cancer. In the second part of the letter her father read, she spoke to this. “Be kind to one another. Do nice things for friends, family and strangers. Ultimately make the world a better place. Don’t do things that will hurt yourself or other people. The number one example is smoking. Please don’t intentionally give yourself or others cancer. It’s not as fun as it sounds. Please quit smoking today. Continue to support me and give me hugs. Your love and attention are what has kept me going. Thank you for loving me in that way. I am very lucky. Love and support my family and friends when I’m gone. They’ll need the love and hugs I can’t give anymore. And maybe tell an occasional joke at their expense. Be sensitive to people with cancer. Don’t tell them that you knew so-and-so who died; or that God doesn’t give us more than we can handle (sometimes He does, He did with me). Don’t tell them that miracles happen every day. They don’t, or they wouldn’t be called miracles. Don’t tell them that they’ll be okay. A lot of them won’t be. Don’t try to convert them or tell them that God just wants them back in heaven, that it’s their time. That is not comforting. Her family isn’t sure when she wrote this letter, or if she ever intended for anyone to see it. What is most remarkable is that it was written so gracefully. She could have been so bitter and angry, but instead she was eloquent, thoughtful, and kind. Her wishes and advice will help change how I conduct my life and the way I treat others. I hope they help everyone. I know she would have liked that. Beautifully written. Made me tear up. When I think of Jackie! I honestly don’t think of her cancer battle first. I think of the funny USC stories you wrote about. And her adventure van. So, even though I never knew her..she is more than the girl with cancer. I am fearful of saying the wrong thing – hearing Jackie talk about what she needed to hear when she was sick helps to clarify what is helpful and what isn’t. What great advice, from such a great woman. Beautiful and brave letter. Heather (& Jackie’s dad) thank you for sharing it with us. After burying 2 if my sons i feel like i should be some sort of expert on what to say but i can’t always articulate my feelings as eloquently as Jackie did in her letter. I will refer others to Jackie’s words of wisdom. Heather, thank you again for all your words of wisdom as well. Take care. What an incredible person to be that compassionate and gentle with others when, considering her circumstances, she had absolute license to be otherwise. Her advice is so good. I will remember it. You are so lucky to have known such a beautiful person. Thank you for all the Jackie! stories. Thank you for this reminder today. One of my closest friends is having a biopsy done this week to determine if what they think she has is really what it is. I don’t have the right words for her, and I doubt I ever will. I just want to be her friend and support her through whatever is thrown her way. I don’t know anyone who’s lost a child, but I’ve read your post about what to say to grieving parents several times. I think it is wonderful advice about anyone who is grieving. This is wonderful, too. Jackie! was so eloquent and thoughtful. Thank you for sharing her words. So simple and yet so profound.” Be Kind to on another”, a nice little reminder but a little sad that we actually have to remind ourselves of that sometimes. She was so beautiful on the outside and the inside as these words are evidence of that. Those lessons Jackie penned are so important. I wonder if Jackie’s family would be comfortable publishing it somehow, either in an online way or in a newspaper. We so often look over the life of a person living with cancer–not a person discovering a diagnosis, not a person spending their last few days on earth. People live with cancer everyday, but it’s clear Jackie thrived. I will cherish her thoughts and advice and return to them as well. Thank you so much for sharing this. Thank you for continuing to share Jackie with us. Her words inspire and affect. 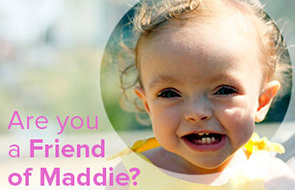 She has touched my life just as Maddie continues to on a daily basis. Thank you for sharing your friendship with Jackie with us. You both have touched us all. Beautiful! Thank you for sharing this with us, Heather. Very important words from the world famous Jackie!!! Thank you for sharing them…. Thanks for sharing that letter. My mother was just diagnosed with cancer. I can’t tell you the number of people who’ve shared stories to tell me “of so and so who’ve died”. THIS! This hit me hard. My parents are preachers of the same kind that Jackie was speaking about. We just found out about a week and a half or so that my Mom is in stage 4 pancreatic cancer. I went cold with the news. I couldnt move, speak or react. She had an endiscopy to determine whether she needed to go through a laproscopic surgery to pick her apart first, and she is going in today for the laproscopic surgery, which will only make her weaker for her chemo that she will have to go through for the next 5 months, when they can finally quell the mestastisizing tumors. THEN she has to go for the full blown surgery. Then start again on the Chemo. My thoughts have bean rivited on Patrick Swayze, who died of the same thing, and was much younger than my Mom. He only lived a year and a half. My Mom is 71. I am dying a hundred deaths right now. I just want her forever. Oh Melissa, I am so sorry! My heart goes out to you. Such thoughtful and, as you said, kind words when she had every right to be bitter and mean. Thank you for sharing. When I think of Jackie! I think of her grace and courage. Her beautiful smile. Her beautiful eyes. I think of her parents, siblings, family and friends. I follow her on CB and her mom and dad are amazing. I can tell where Jackie! comes from. They are so full of love and caring ways. There letters/ stories to Jackie! breaks my heart. This is so so beautiful. And wise. What a woman … what a Spirit, in the world. Thinking of you heaps, Heather Homegirl. HEAPS. And she bloody well did. She is a firecracker of a girl, your Annie. Gives me hope. Jackie’s words were incredible. I’m so glad you had some alone time to meditate on them…and remember her…and see her in your mind’s eye.